Phonics Bingo is Copyright © 2009-2019, Answers 2000 Limited. Unauthorized reproduction is strictly prohibited. 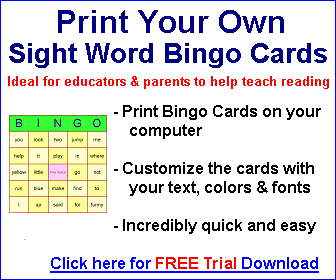 ALL BINGO MATERIALS ON THIS WEBSITE (INCLUDING BUT NOT LIMITED TO SOFTWARE, PDF FILES, PRINTABLES, AND INSTRUCTIONS) ARE INTENDED ONLY FOR EDUCATIONAL AND ENTERTAINMENT PURPOSES. THE BINGO MATERIALS HAVE NOT BEEN VERIFIED AS COMPLYING WITH ANY PARTICULAR STANDARD OF RANDOMNESS, FAIRNESS, OR LACK OF BIAS. THE BINGO MATERIALS ARE NOT INTENDED FOR GAMBLING PURPOSES, AND MAY NOT BE USED IN CONJUNCTION WITH, OR TO FACILITATE GAMBLING OF ANY KIND. THE BINGO MATERIALS NOT INTENDED FOR USE IN CONJUNCTION WITH, OR TO FACILITATE, ANY ILLEGAL ACTIVITIES. USE OF THE BINGO MATERIALS IN CONJUNCTION WITH, OR TO FACILITATE, GAMBLING OR ANY ILLEGAL ACTIVITY SHALL RESULT IN THE IMMEDIATE TERMINATION OF USER'S LICENSE TO USE THE MATERIALS, AND WHERE PAYMENT HAS BEEN RECEIVED, WITH NO RIGHT OF REFUND. NOTE: SOME JURISDICTIONS MAY PLACE LEGAL, LICENSING OR OTHER RESTRICTIONS ON BINGO ACTIVITIES. IT IS WHOLLY THE USER'S RESPONSIBILITY TO COMPLY WITH ALL APPLICABLE LAWS. Regarding Products from Amazon.com: Product prices and availability are accurate as of the date/time indicated and are subject to change. Any price and availability information displayed on Amazon.com at the time of purchase will apply to the purchase of this product. Some graphics are public domain images, or derived from public domain images by NASA, NOAA, U.S. Fish and Wildlife Service, and U.S. Department of Agriculture. Answers 2000 Limited and are products, are NOT in any way, associated with or endorsed by any of these organizations. 1. You may browse, download, view, print, copy onto the hard disk of your computer and use all material (other than downloadable software or other items, the use of which may be regulated under separate or additional terms) from the Site as an information resource in good faith only. Any other type of use, including (without limitation) any commercial reutilisation of the contents of the Site, requires the prior written agreement of the Company. 2. Your use of certain pages within the Site may be subject to further terms as indicated on the pages in question. If you make any use of those pages subject to additional terms you will be deemed to have accepted those additional terms. 3. Non-UK users must appreciate that the information contained on the Site might be restricted by local laws. Information, content and links, including advertising, may be subject to local laws at the point of use. (viii)	in any way that might bring the Company or any employee or director of the Company into disrepute. 5. Whilst effort has been taken to ensure the accuracy of the information provided (including third party information) on or in the Site by the Company, its employees and agents, the contents of the Site and third party products and services are naturally subject to change from time to time and the Company cannot guarantee the accuracy or completeness of the information. Any slights to people or organisations are wholly unintentional. You are responsible for checking the accuracy of relevant facts and opinions given on the Site before entering into any commitment based upon them. (i) This publication may include advertising or items that might be considered to be advertising, either for the company or for third parties. As it is not practical to label each fragment of text or hyperlink etc., with a detailed explanation: users are advised that all material in this publication may be, or may be considered to be, advertisement. (ii) Some information or other content that may appear within the publication may include content or data or other items, posted by or provided by or controlled by, visitors to our various web sites ("users") or advertisers or other third parties without the Answers 2000 Limited necessarily being aware of, or monitoring, or reviewing, every such item. Such items may include, but are not limited to: banners or other advertisements, other forms of advertising materials, text elements, images or other graphics elements, hyperlinks, data-feeds/contents-feeds used in generating our search or products results, article-feeds, news-feeds, message/discussion board or guest book contents, various forms of pages where a visitor may leave text and/or hyperlink and/or other content, items submitted to search results pages, etc. Any claims or opinions or statements, etc. made in such items are solely the claims or opinions or statements, etc. of the relevant user or other third party. Answers 2000 Limited is not able to, and does not, vet or monitor or review every such item, nor to do so in real-time. Answers 2000 Limited does not necessarily agree with or verify or endorse any claims or opinions or statements, etc. made in any such item. If we are alerted to any material that may be offensive, illegal, libellous, slanderous, harassing, hateful, violates any copyright or trademark or service mark, deceptive or misleading, unethical, or otherwise inappropriate, etc. : We will remove it as soon as possible. We also reserve the right to remove any materials as we see fit. Answers 2000 Limited reserves the right to disclose to appropriate authorities, whatever information it might have about the relevant user or advertiser or other third party should this be necessary for any reason, in the Company's sole judgement. (iii) All mentions of, suggestions of, ideas for, etc., to make money or how to make money (or achieve other results such as increasing web site traffic), whether express or implied, are strictly based on the authors' opinions of what is believed to be possible, with appropriate facilities, funding, management, and expertise in sales, marketing, writing, general business skills, technical skills, and any other necessary skills not listed. We do not guarantee that any person or business will make a profit as a result of using the information in this publication, or any of the products or services or information that we might provide or link to. As with any business, it is up to the individual owner of said business to ensure the success of the business. You may make more or less than any sample figures or results that might be quoted on our web sites or other publications. All business involves risk, and many businesses do not succeed. Further, Answers 2000 Limited does NOT represent that any particular individual or business is typical, or that any results or experiences achieved by any particular individual/business is necessarily typical. Individuals/Businesses that may quoted or referenced in our publications, may have advantages over typical individuals/businesses including, but not limited to: exceptional business acumen, talent, skills, experience, motivation, luck or foresight, etc. It is strongly recommended that readers get professional advice, and contact any and all international, national, federal, state and local agencies which may regulate, tax or otherwise control the commencement of a business. 6. The business activities conducted on the Site and any other websites are carried out by directors and employees in their capacity as a directors and employees of the Company and not in any personal capacity. 7. The Company cannot guarantee that your use of the Site will be free from error and/or uninterrupted. The Company, its directors, its employees and its representatives exclude, in so far as it is legally possible, all liability and responsibility for any damages (other than liability for death or physical injury arising out of the negligence of the Company or its officers) including, but not limited to, indirect or consequential damages, damages for loss of opportunity or chance, or any damages whatsoever arising from use or loss of use, data, or profits, whether in action of contract, negligence or other tortuous action, arising out of, or in connection with, any information on the Site or any other Internet sites or the use thereof. 8. On some of the pages of the Site you will be informed of the opportunity of entering into agreements with third parties. The Company is not liable in relation to, and takes no responsibility for, any contract entered into by you with any third party. 9. Where information (including sensitive financial or personal information) is provided to the Company directly through the Site or by email you accept that these methods of communication cannot be 100% secure. The Company cannot accept any responsibility or liability for any damages (other than liability for death or physical injury arising out of the negligence of the company or its officers) arising from the misuse or loss of data or information submitted by you to the Company directly through the Site or by email. 10. Some of the pages on the Site include links to external websites. These links are included to give you the opportunity to access other pages that it is felt may be of interest or assistance to you. The Company is not responsible for the goods or services available on, or any content of, any of these Internet sites. The Company does not endorse the views of any third party websites and advise you to exercise your own discretion in accepting the advice, goods or services available from these third parties and seek appropriate legal and professional advice if necessary. 11. Whilst every effort has been taken to ensure that the Site are free from viruses, the Company gives no warranties they will always be free from viruses and you are responsible for ensuring that you have installed adequate and up-to-date virus-checking software. The Company excludes, in so far as it is legally possible, all liability and responsibility (other than liability for death or physical injury arising out of the negligence of the Company or its officers) for any viruses or any other computer code, files or programs designed to interrupt, restrict, destroy, limit the functionality of or compromise the integrity of any computer software or hardware or telecommunications equipment or other material transmitted with or as part of the Site. 12. The names, images and logos identifying the Company or third parties and their products and services, are the proprietary marks of the Company, and/or may be the proprietary marks of third parties. Any Trademarks or Servicemarks mentioned are acknowledged and properties of their respective owners. Any unauthorised use made of these marks may be an infringement of rights in those marks and the Company reserves all rights to enforce such rights that it might have. 13. These terms may be varied from time to time. Please ensure that you review these terms and conditions regularly as you will be deemed to have accepted a variation if you continue to use the Site after any variation has been posted. information and databank compilation and administration. (iii)	You also consent to the transfer, storage and processing of the Personal Data to/in countries outside the European Economic Area in connection with the processing mentioned above. Your Personal Data may therefore be processed in countries where the rights and benefits conferred on data subjects may not be as favourable as in the UK and the European Union. If you would prefer not to have your Personal Data transferred in this way, please make this clear by sending an appropriately worded message to the Company by sending email to webmaster@ans2000.com. However, please note that unless the Company is permitted to use your personal data in the manner detailed above, it might not be possible for the Company to provide the services requested of it by you. 14.2	If you have chosen to subscribe to one of our email newsletters or other email services: from time to time the Company may also notify you of other goods and/or services offered by the Company or others. If you prefer not to receive such offers or details, you may unsubscribe at any time using the links provided in the message or Site or alternatively send an appropriately worded message to the Company at webmaster@ans2000.com. 15. If any of these terms and conditions should be determined to be illegal, invalid or otherwise unenforceable, they shall be severed and deleted from the terms and conditions and the remaining terms and conditions shall survive, remain in full force and effect and continue to be binding and enforceable. 16. Answers 2000 Limited reserves the right to refuse the business of, or access to any of its web sites, from any person or entity, and without incurring any liability for any such refusal. 18. These terms and conditions shall be governed by and construed in accordance with the laws of England and Wales. Any disputes arising from matters relating to the Site shall be exclusively subject to the jurisdiction of the courts of England and Wales. You agree that any legal action against Answers 2000 Limited (or its directors, officers, or employees) relating to this publication or this agreement will be brought in the courts of London, England, however the Company reserves right to pursue breach of these terms in any jurisdiction.